Say you’re on a diet, but can’t find the perfect snack. Or say you’re about to eat a big spoon of chocolate ice-cream, but have no idea how many calories it contains. These are only two of the of issues we college students might encounter on a daily basis and yet we can’t find solutions for them. In a society that revolves around the latest version of the iPhone or the newest Android update, why not use technology as the gateway to find answers to our food-related problems. These five apps can transform the way we look at food and even the way we look at ourselves. Also known as the “healthy diet partner,” this app tracks what food you’ve been eating. It helps you achieve weight goals while educating you about what nutrients are in your meals and warns you what foods to stay away from. So whatever Mom can’t tell you when you’re away from home, Fooducate can. This app is your guide to locating menus for fast food restaurants and coffee shops. To avoid long lines, you can take a look at the menu in advance. Or, if your friends are already at a restaurant, you can text or email them your exact order. Whether you want something salty, sweet, creamy or crunchy, this app will provide you with great on-the-go food options to keep your stomach content while providing tips for satisfying snack choices. This is where some of the best brews can be found. 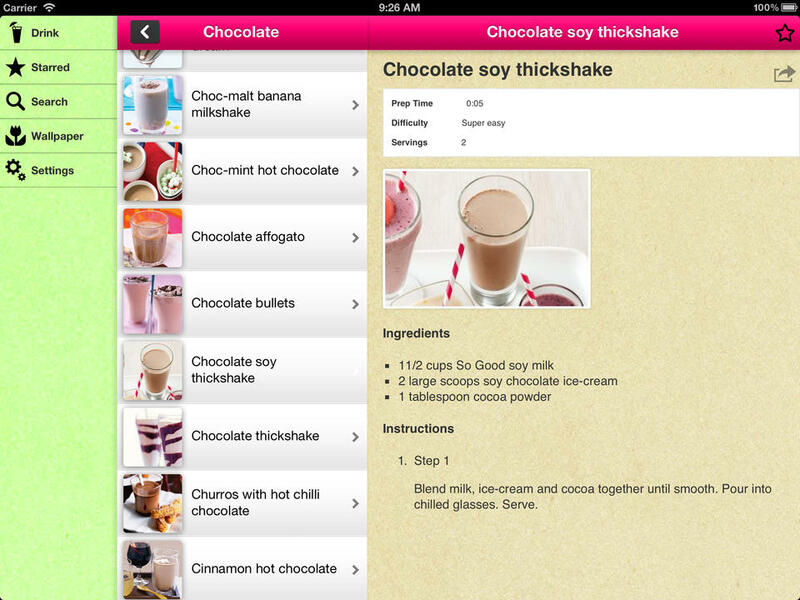 Whether you need a lemonade recipe to quench your thirst or you want a hot chocolate recipe, Drink Recipes can provide you with over 1500 recipes to make any and every sort of drink for all sorts of occasions. To receive nutritional value on the foods you buy, simply scan the barcode on the products using Shopwell. It also helps you find specific foods to meet dietary needs and even searches for healthier alternatives to the foods you choose. It’s basically your pocket-sized nutritionist. Each of these apps can not only benefit how healthy we eat, they can make our lives much simpler. And the best part? All of them are free.